I have had the good fortune to observe cichlids in three locations in the wild. In 1987, I spent six weeks observing cichlids in the San Marcos River, Texas. In 1989, and then again in 1996, 1997, 1998, 1999, 2000 and 2001, I spent several weeks each year studying and observing cichlids in the Rio Puerto Viejo in northeastern Costa Rica. 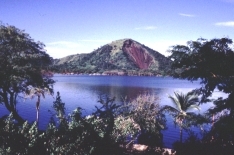 In 1999, I spent a week in Nicaragua studying cichlids in volcanic lakes. This past January, I travelled to Chiapas, Mexico to study the cichlids there. Thinking about a Cichlid Expedition? Increasingly people are interested in taking their own trips to the tropics to see for themselves the marvels of cichlids in the wild. This is great! The key to an enjoyable cichlid experience is preparation. You don't need a ton of stuff, but you do need certain things. The most important things for seeing cichlids are a mask, snorkel and fins. I STRONGLY suggest some form of wetsuit. People invariably say to me "I'm used to the cold" but what they don't realize is that moving water pulls the heat from your body much faster than even a cold lake. Also, tropical rivers are frequently covered by overhanging vegetation so you don't get much sunlight to warm your back. I wear a full wetsuit (jacket and johns) for my work in Costa Rica. Eventually I will flesh out this section more, but for now, take a look at pages I have prepared for a Tropical field ecology course that I took to Costa Rica in the fall of the 1999. By the way, we had a great time and I'm leading a similar course in the spring of 2001. Here are some useful websites for information pertinent to cichlids in the wild and studying them.